I adore a good magazine. Actually, I'll look at pretty much any magazine I can get my hands on...even a not-so-great magazine usually has good pictures. I love that you can read a magazine pretty much anywhere...I take them to the beach, on airplanes, in the bath, to the gym, you-name-it. I also love that a magazine is not a forever thing. When I'm done, I can recycle it, pass it along to a friend, or sometimes I leave a good one somewhere I think someone might enjoy it (like the waiting room of the ER). I think magazines are the perfect gift. Ever. 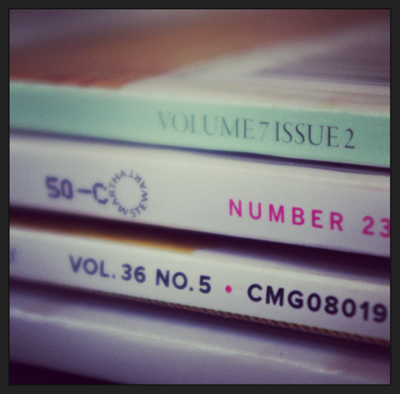 I would love nothing more than to get a big pile of magazines as a gift. Amd so I assume that others think the same way I do. A stack of your favorite magazines tied with a wide grosgrain ribbon is the perfect go-to gift for a multitude of occasions. I have used them as a hostess gifts, taken them on hospital visits, birthday presents, bon voyage gifts, mother's day gifts....it's just the perfect present for someone you know well or someone you know a little. If you are far away from someone you love, a very personal gift to mail is to take a quirky magazine and a stack of post-it notes and leave comments on what you find interesting, weird, or funny. It offers a piece of yourself, and takes time to do, which is the most we can ever offer to another.